So, it’s National Candy Corn Day! And, I found a recipe for candy corn…and, tomorrow is Halloween. What! So, if you’re into some DIY candy making, you can follow this easy recipe from the kitchn. First, sift together the dry ingredients, the powdered sugar, dried milk, and kosher salt into a mixing bowl using the strainer. Next, melt the sugar, corn sugar, and butter in a 2-quart sauce pan. Place the pan over medium heat and cook until the sugars are dissolved and the butter has melted, swirling the pan gently once or twice. This will take 6 to 8 minutes, depending on your stove. While that’s going, line a baking sheet with a nonstick baking mat or parchment paper and set it near the stove. 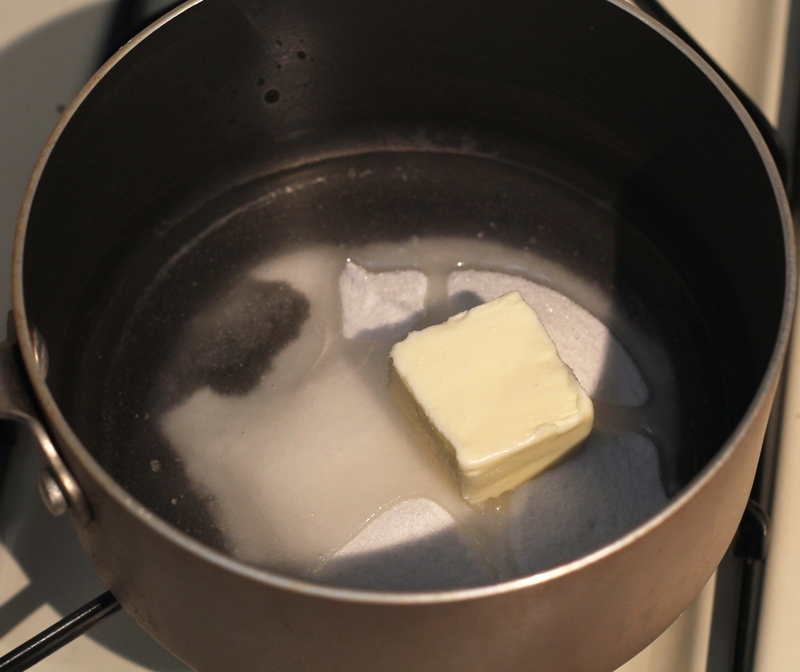 Cook the sugar syrup to 245°F – 250°F. Clip a candy thermometer or instant-read thermometer to the side of the pan. Let the syrup come to a full boil, still over medium heat. Continue cooking without stirring until the syrup is reaches 245°F to 250°F. Depending on your stove, this will take anywhere from 1 to 5 minutes. If you go over the temperature, quickly add a few tablespoons of water to the pan to reduce the temperature, and monitor the temperature carefully as it reheats. Remove from heat immediately once the syrup reaches temperature. Add the vanilla to the syrup and the dry ingredients and stir with a stiff heatproof spatula until you’ve formed a thick paste-like dough and very little dry mixture remains. Pour the dough out onto the baking sheet. Cool the dough 5 to 10 minutes until you are able to handle it. Don’t wait too long, though; the dough will stiffen as it cools and become harder to roll out. Cut the dough into three pieces using a knife. Make a well in the center of one piece and add 10 drops of yellow food coloring. Make a well in the center of another piece of dough and add 10 drops of yellow food coloring and 5 drops of red food coloring, to make orange. Knead both pieces of dough until uniform in color. 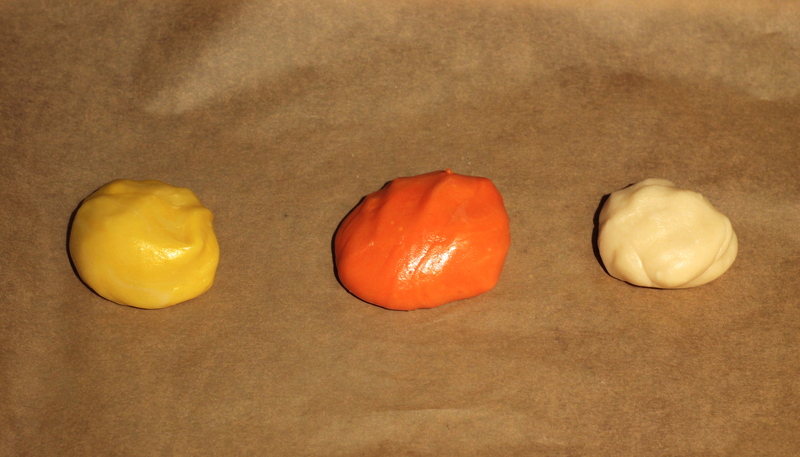 Be sure to leave the remaining white piece of dough well away from the kneading area so it doesn’t get any color. Pinch off a piece of dough from each section roughly the size of a ping-pong ball. Roll each one into a thin 1/4-inch thick rope. If a rope gets too long and hard to roll, you can break off the end and mush it back into the remaining dough. Lay the ropes side by side in whatever order you like (yellow-orange-white is classic! ), and then gently pinch them together so they stick to each other. Gently roll over the ropes with a rolling pin just to flatten out the curved edges. Use a chef’s knife to cut out triangles of candy. Angle your scraper at a forward-slash angle and then at a back-slash angle as you work down the length of the ropes. Spread the candies out on the baking sheet to dry for a few hours. Separate any candies that are sticking together. Once dry, the candies can be stored in an airtight container for several weeks. Like commercial candy corn, these candies are good until they become too dry to chew! Happy National Candy Corn Day and Happy Halloween! You can find the original link and printable recipe here. 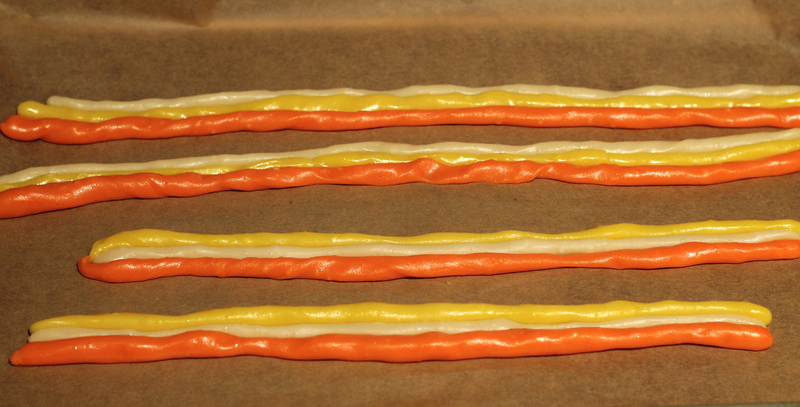 This is so amazing – that you would take the time to make your own candy corn! I think it is fantastic that you not only gave step by step instructions, but the pics help immensely. I am definitely going to try making this, thanks for another great blog!